Do I need to buy MG for my phone and my wifes phone to sync all lists properly? Hi Kevin, thanks for your feedback. 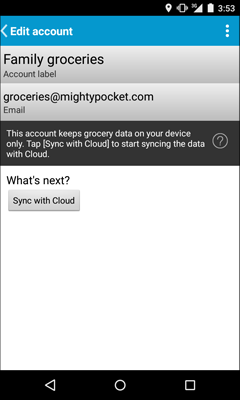 Yes, both phones need Mighty Grocery Full in order to sync lists properly. Question: How do I get the Pick List on my phone to be accessible on my wife’s phone? 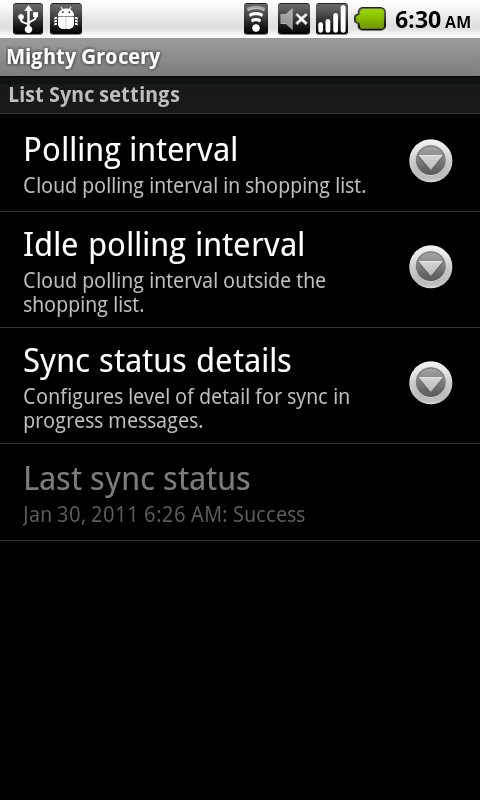 (Note: Sync’ing is working perfectly between the two phones.) Both phones have the upgraded version of MG. I have only 1 account on my phone. Have 2 accounts on my wife’s phone: a master one and a guest (it is a guest of the master account on my phone). I backed up my phone to the cloud and then restored it to her phone under the guest account on her phone. However, I can not see all my pick list items (there are over 500) on her phone. My history is visible on her phone, but I can not get it to populate into her Pick List. Only the items purchased since we sync’ed are in her Pick List. Have read the user’s guide and other posts relevant to this subject but don’t see a solution. Suggestions would be appreciated! PS. Looking forward to having the ability to 1) assign items to multiple stores and 2) having different aisle config for my pick list than my stores’ aisles (i.e., a Pantry function). Would also appreciate the ability to add items while in the Pick List rather than having to switch to the Shopping List. Hi Phil, thanks so much for your feedback. Unfortunately, only shopping lists are getting sync’d at the moment. Hopefully ability to sync Pick lists and History will be available soon. As for copying Pick list to your wife’s phone, the steps you describe sound good. Have you used “Restore from another account” command under More –> Backup on cloud on your wife’s phone? Thanks for supporting planned features. BTW have you tried adding items directly to Pick list in Menu –> Settings –> Pick list –> My picks ? Pick list configuration is also accessible by clicking the Gears button under Pick list tab. I understand that you can restore your data to a new phone, but I was wondering if it is necessary to repurchase the app before you can do that? Hi Barb, thanks for your question. No, you don’t need to buy the app again. Just use the same Google Account to register your new phone and all your paid apps should be available for download without extra payment. I have the full MG app. I have a new phone. I have an extensive list of favorites I don’t want to reenter. Yeah for Sync! Unfortunately, while it looks like I have sent my favorite to the cloud (i.e. Cloud Actions, Push Lists, Select Favorites, Push List), when I get on my new phone and try to retrieve my favorites -i.e. Cloud Actions, Pull lists …) the only list I’m presented with is Groceries which happens to be empty. Where is my Favorites list? What am I doing wrong. Hi Pete, thanks for your question. Kindly note that there are two accounts registered for your email. I’ll be contacting you via email to keep your private information undisclosed. Making some progress here, but still confused. I went to accounts and chose Sharon’s account and pulled what I though would be her list for Costco. I still had the one item ‘asparagus’ when done. So I go to my account, and then I go ‘pull’ list, and it pulled the list with 10 items back again. So now what confuses me is when would I use Sharon’s guest account that is on my device, and vice versa? If I want to push my list to Sharon for example, do I go into her Guest account and ‘Push’, or do I go into my account and press ‘Push’? 1. I’d recommend using a single account on both your phones. 2. Once you push lists from phone #1 and then pull lists from phone #2 all lists will be synchronized instantly from that point on. There is no need to push and pull changes manually. I didn’t realize that you could use one account between the two phones, that will make it much easier. Presuming it does not matter which one, I’ll delete one of them and see how it goes so I won’t have to eat only asparagus for the next 2 weeks . BTW, Although I’m subscribed to this thread I don’t seem to be getting any notifications (checked my SPAM). It may be something on this end but thought I’d mention it just in case. I’m pretty confused when it comes to trying to get sync set up, I guess it would be fair to say this process seems far from intuitive. I had a list with say a dozen items. I pushed them to my spouse’s account. She pulls and we see the list. We wait to see if the accounts will now auto sync, they apparently do not. Awhile later, my list only shows one item. – Where did all my items go? – If you are going to push a list, in accounts do you select your own account and then ‘push’ your list to the guest account, or do you open the guest account and then say ‘push’ in order to push the list on your device to that guest account? THis part I fund to be the most confusing. 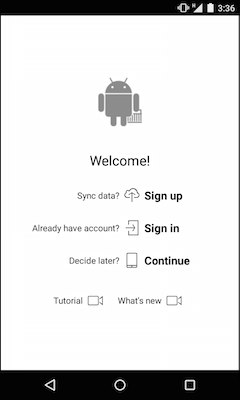 When I am in my own device, do I check the auto sync button for my account or for my spouses account, as it appears that when you check one, the other is unchecked. – After doing all this pushing and pulling are the accounts not supposed to auto sync from that point on? – I can still see the items in her list, but if I push the list on her device and pull it on mine, they still do not show up. Is it only possible to backup to Cloud? As it is not always possible to have an internet connection wondering if it is possible to backup to local storage such as SD Card? John, thanks for you question. Yes, it is only possible to create backups on Cloud. We will need more people interested in this feature to add it to our plans. The problem with the existing strategy is all users are reliant on one server that is tied to a specific entity. If the business goes ‘out of business’, all their backup and sync options are null and they have a defunct program on their hands. If there is an option to access the backup file on an independant cloud storage media or locally the program will be much more robust and gain a greater following because it will always be functional even if the dev’s withdraw down the road for any reason. Just out of curiosity what is the status of your server, does it have redundant storage on seperate backbones with DNS on different class ‘C’ subnets in case of failure or prolonged DOS attacks? Just wondering what sort of uptime or server reliability can be expected, obviously I don’t think users are expecting NASA grade backbones from a grocery app, but it would be good to satisfy curiosity withal. John, we are going to offer more import/export capabilities on our Advanced Web UI which is anticipated later this year. As for server infrastructure, we are doing our best to keep data safe and servers highly available. I was wondering how to sync between two devices? 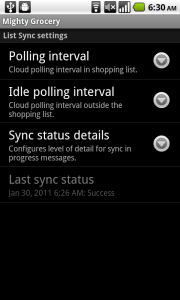 Kindly note that this page describes how to sync between two devices. 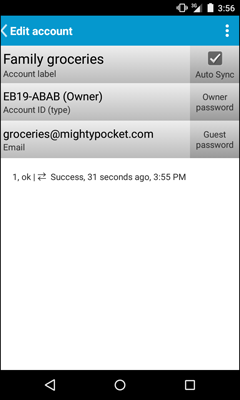 Shortly: create account on phone #1, push lists to cloud, login to account on phone #2, pull lists from cloud. Since that moment on the shopping lists will be in sync. Hi Dotty. I will contact you via email to help you restore access to your account. Is there a way to determine the date and time a backup was done? Also, since the backup on the cloud is deleted after 30 days, would it be possible to get an alert about this? Or is this already in place and I just have not triggered it yet? Thank you from the pest, Prakash! Hi Prakash, thanks for your question. Unfortunately, there is no way to see when the latest backup has been created. Kindly note that we reserve the right to remove backups after 30 days, but this practice has not been in place yet. We plan adding reminder to create backups in the future.